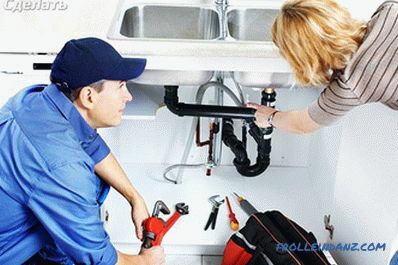 Problems with home plumbing are a rather unpleasant situation that every housewife faces in her life. Some elements can become clogged, this happens because small particles get into the drain hole of the sink, accumulate, prevent the passage of water, while there is a rather unpleasant smell. When a similar problem occurs, many wonder how to clean the sink from clogging? 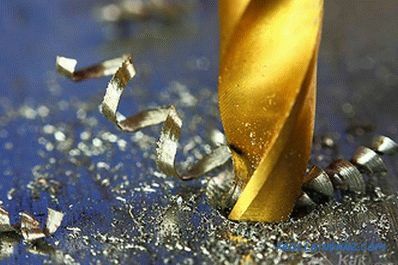 To date, there are quite a few methods of cleaning clogging. Each of them implies the use of a certain means. 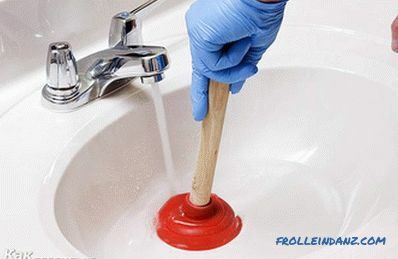 A fairly simple method that many people know about is using a plunger. This tool is in almost every house, in appearance - the design, as part of it has two parts: a rubber cap and a handle. 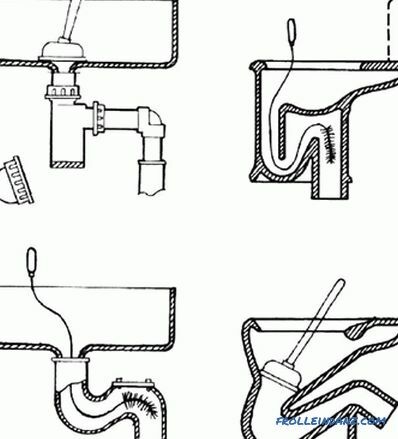 The action of the plunger is characterized by the appearance of a water hammer, due to which all the garbage in the pipe begins to move into the sewer riser. The plunger must close the drain hole. Wait until the water covers the pear from the top of the rubber, then make a certain amount of vigorous upward and downward movement. The actions performed will create pressure drops in the drain pipe, which will begin to destroy the plug that forms the blockage. After that you can remove the plunger. 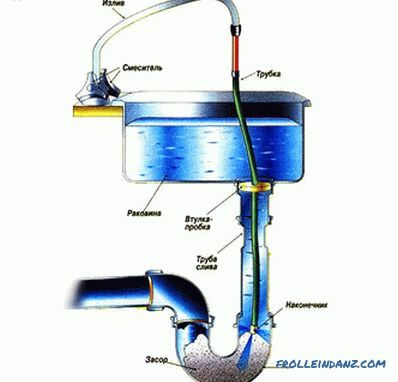 If the plug is removed, the water will begin to flow through the funnel into the drain pipe. If the water runs out very slowly or stays in place, then the procedure needs to be repeated until a visible result is obtained. Contaminants that will appear from the drain pipe on the surface of the sink should be removed without delay. A large number of people prefer to use traditional methods to eliminate blockages. The most common is the use of soda. At the same time, completely different recipes can be applied, however, they all unite in that they consist in dissolving the fatty component of blockages, due to which a decrease in the density and size of the plug occurs. Using vinegar and soda at the same time. To do this, 150 g of soda is poured into the drain hole, and the same amount of vinegar is poured on top. After that, the hole is closed with a special lid so that the resulting foam does not crawl out. The foam is quite caustic, it corrodes any pollution that forms in the pipes. 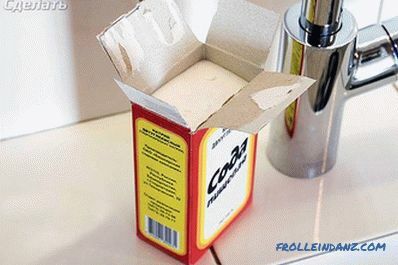 Removing clogging with soda and vinegar is the most popular method. It is necessary to take 3 tbsp. l soda, pour them into the drain pipe. After that, flush the drain with a large volume of hot water. 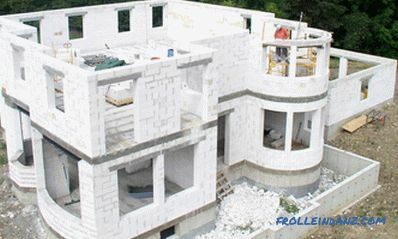 The blockage is eliminated in a fairly short time. To clean the clog, you need to take soda, vinegar and laundry detergent. An equal amount of these components is poured into the drain pipe, after which the drain is filled with vinegar. Close the drain hole with a lid, wait about 20-30 minutes. After this drain sink must be rinsed with a large jet of hot water. 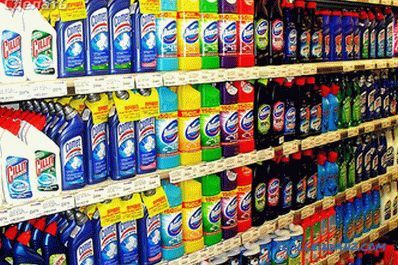 Soda and vinegar are often used to clean the sink in the kitchen, because it is there that accumulates greasy dirt, which subsequently forms a blockage. 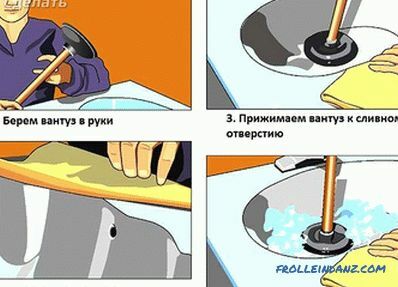 If there is a blockage in the sink, then you can get rid of it with the help of special tools that are sold in any hardware store. They are very easy to use. A special instruction is attached to each product, in which the required amount of the substance is indicated to eliminate the blockage. 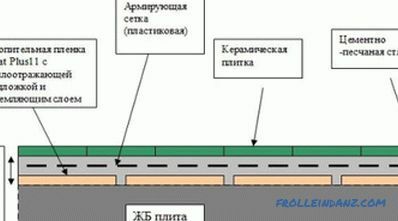 It is poured into the drain pipe and sewage, the substances in the composition begin to break down the pollution. After a certain time it is necessary to rinse everything with plenty of hot water. 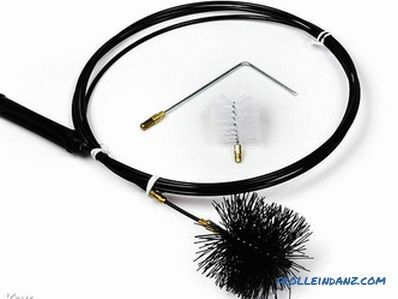 Due to the high aggressiveness of the components, it can corrode the gasket from rubber. In some cases, there is a violation of the integrity of the pipe, especially plastic due to the constituent chemical elements. Special blocking agents should be used quite rarely, use quarterly is best, it will allow to keep the pipes clean without damaging their integrity for a long time. Very often, these tools are used to eliminate blockages in the bathroom. The presence of a sanitary cable makes it easier when a blockage occurs. Very often it is used in the case when the plunger is not able to cope with pollution. Insert the end of the cable into the hole of the drain or bypass pipe and direct it towards the resulting blockage. Cleaning together with a cable is best done together. The first person will push him forward, and the second will create hydraulic pressure, spinning along the longitudinal axis with a special handle. 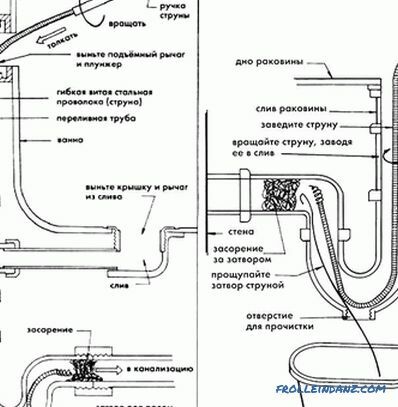 To go around all the joints and turns of the pipes, it is necessary to scroll the cable very slowly, it is under this condition that it will be screwed into the clog. When passing a blockage or its maximum pushing in, it is necessary to make several translational movements, after which to get the cable, to clean it from dirt. If the obstruction is sufficiently strong, the procedure must be repeated. This should be done until the pollution is completely removed. You should also remember that you only need to use the cable that is smaller in diameter than the drain pipe. Mechanical cleaning in the sink can be removed manually. 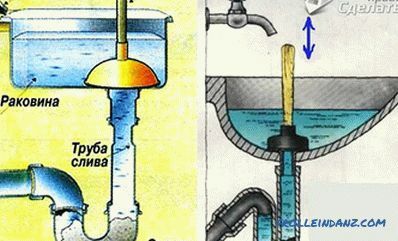 Manual cleaning from clogging consists in cleaning the siphon, which is a sump located under the sink, and dirt that does not enter the drain pipe is deposited in it. If a plastic siphon is used, it can be cleaned very quickly. To do this, it is disconnected from the pipe, disassembled and cleaned. Before work, you must release all the water from the sink. After that, remove all the dirt from the bottom of the siphon, view the state of the corrugated pipe and washed it. After all the actions the siphon is screwed into place. The task becomes more complicated if you use a siphon made of cast iron. 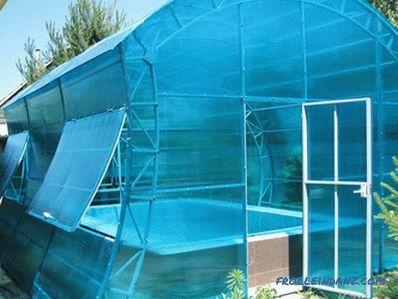 It is attached with bolts and is a non-separable structure. 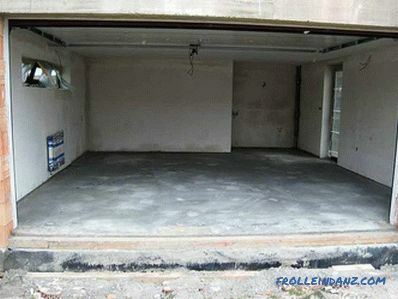 It must be cleaned with a cable, then rinsed with plenty of water. Only after that it is set in place. You can clean the sink from clogging at home in a variety of ways. The use of each depends on the degree of contamination, as well as the type of pipes used. The simplest and fastest method is the use of special tools, however, it should be remembered that they can cause violations of the integrity of the water supply system.